Last Saturday Stuart and I went to see new plays The Inheritance Part 1 and 2 at the Young Vic in London's glitzy Waterloo. Wow! What a show! What a pair of plays! It is up there in the top ten of plays I have seen on the London stage. It spoke to me. It made me laugh. It made me cry. 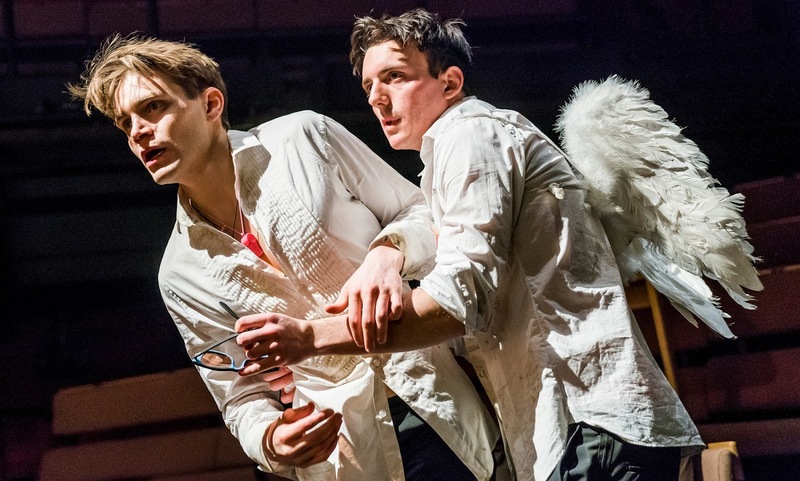 Being compared to Angels in America and with both plays together running at nearly 7 hours the task of watching gay playwright Matthew Lopez's epic might seem a daunting one. But it was really worth it. They are simply wonderful. Hilarious, profoundly heart-breaking, and a joy. Inspired by the novel Howards End by E. M. Forster and directed by Stephen Daldry this really is a must-see event from the Young Vic. Ten gay men live in New York a generation after the height of the AIDS crisis. They are aspiring playwrights and all want to write something but are lacking inspiration. They conjure up the spectre of E. M. Forster and in a fantasy tell a joint story. A story of how to tell a story. The story of themselves, a story of their imagined characters, and a story of the generation that preceded them. A story of inheritance. Have you ever wondered why there isn't a word in the English language for the fireworks that go off in your brain when you finally kiss someone you've wanted for years? Or for the intimacy and tenderness you feel as you hold the hand of a suffering friend? Then this is the play for you. What is it like to be a young gay man in New York? How many words are there now for the different kinds of pain, the different kinds of love? If that sounds heavy, don't be put off. We laughed our God-damned arses off. Stand out performances were Andrew Burnap as the superb scoundrel Toby Darling, Samuel H. Levine as "All About Eve" star actor Adam and damaged rent-boy Leo, Kyle Soller as magnificent, super-nice Eric Glass, Paul Hilton as sage Walter and E. M(organ) Foster, and Vanessa Redgrave as Margaret. This is an important work. A funny work. And a must-see work for any gay man. But bring tissues. It's heart-breaking too. People around me were holding their sides from laughing and later sobbing loudly.